This week I was on one of my favorite websites, The Dating Divas, and I found this great date for a Dinner & a Movie. If your looking for great date ideas, check it out! I decided I would do this date for Limi and I this week, and it would be a bonus, because I would have a new recipe to try! Well for this date they actually decided to do a Greek dessert to go along with the movie, and they got the recipe comes from Chef In Training. 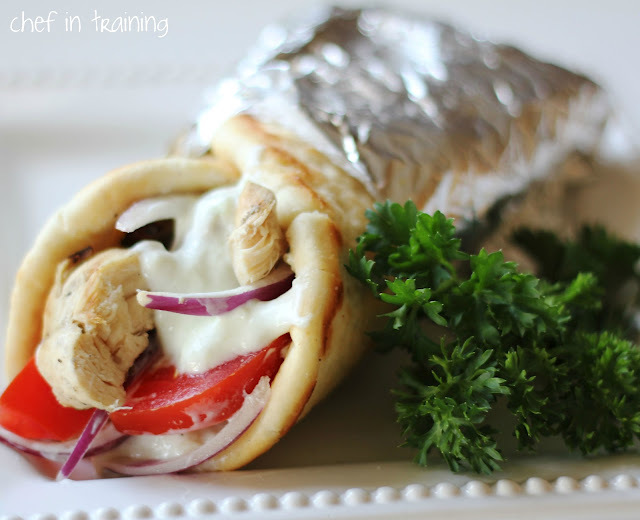 As I was browsing around this fabulous website I found this recipe, for Chicken Gyros and decided to do this with our movie instead. All credit for this recipe goes to Chef in Training, because I tried the recipe, loved it and wouldn’t change a thing! It is so good! It took me quite a while to make everything (about 3 hours) so if you are short on time I would recommend making the flat bread the day before. Cut chicken into slices. Juice the lemons, but save the peels. Combine all the ingredients, including the lemon peels, in a ziplock bag and shake to mix. Let the chicken marinate for at least 2 hours (2-4 hours). Grill the chicken, or cook it in a skillet with the juices. Grate the cucumber into small shreds. Squeeze off all the juices. Combine all other ingredients in a bowl with the cucumber shreds. Mix and serve, or preserve in the fridge. Heat the milk until warm to the touch. Add sugar and yeast and allow the yeast to activate (let it sit for 3-5 minutes). Once activated, add the salt. Skip to the next paragraph. Heat the milk until warm to the touch. Add sugar, yeast and salt. Mix. Proceed to the next paragraph. Move the dough to a lightly greased bowl, cover with plastic wrap, and allow to rise for 2 hours. Once it has risen, split the dough into 12 pieces (I only did 8), cover with a towel and allow to rise for another 30 minutes. Put a pizza stone in the oven and preheat the oven to 500 F.
Once risen, roll each piece of dough into a circle, about 6-8 inches each. Place on the stone and spritz with water. Bake for 2-5 minutes, or until brown spots begin to appear. Remove from the oven and coat the top with butter. As each piece of bread comes out of the oven, spread butter on it and then stack them.